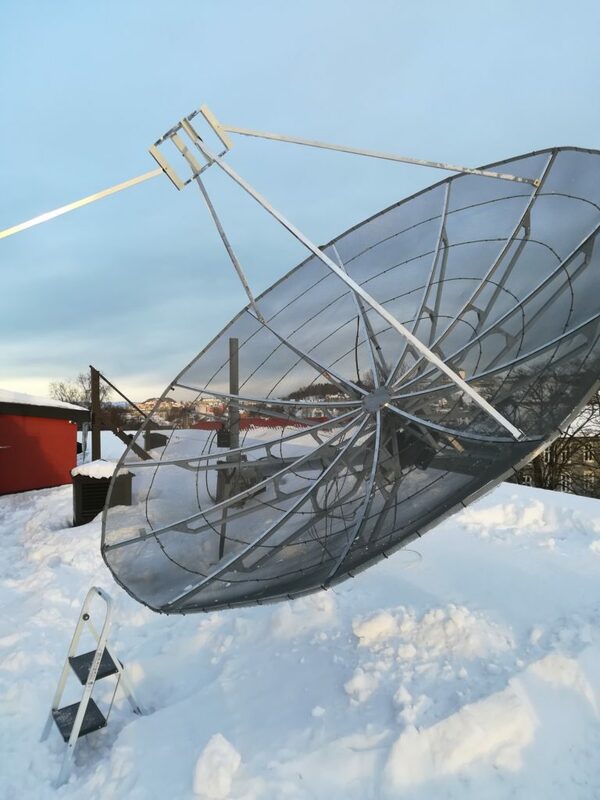 We have been working on getting our parabolic dish setup working for about one and a half years now. 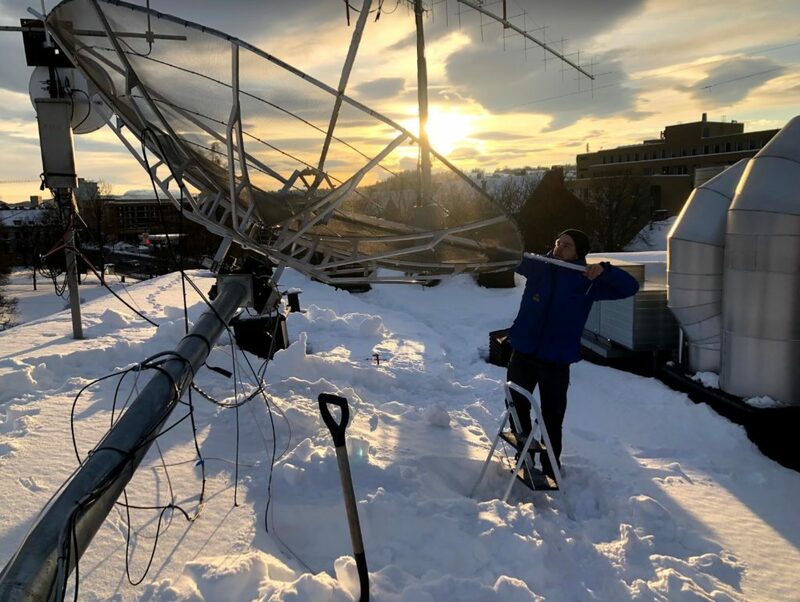 We are not setting any speed records, but it is nice to be able to announce that we are finally ready to go on the 23 cm band. As the “Academic Radio Club”, we often pursue ideas and projects that are perhaps more academic than they are practical. One such pursuit would have to be the notion of five amateur radio bands in a single feed. 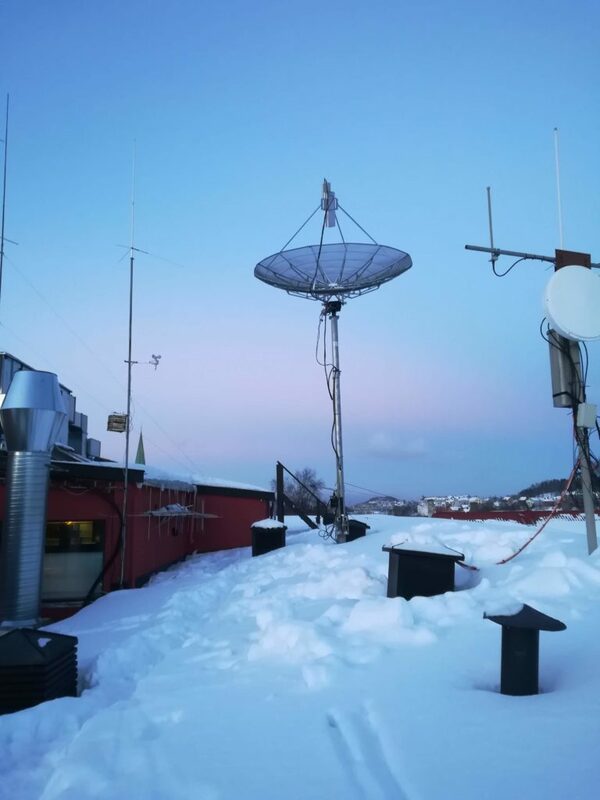 While the author still firmly believes that it is doable, it is definitely a labor intensive and hard thing to attempt for a group with no previous experience with Earth-Moon-Earth (EME) contacts. 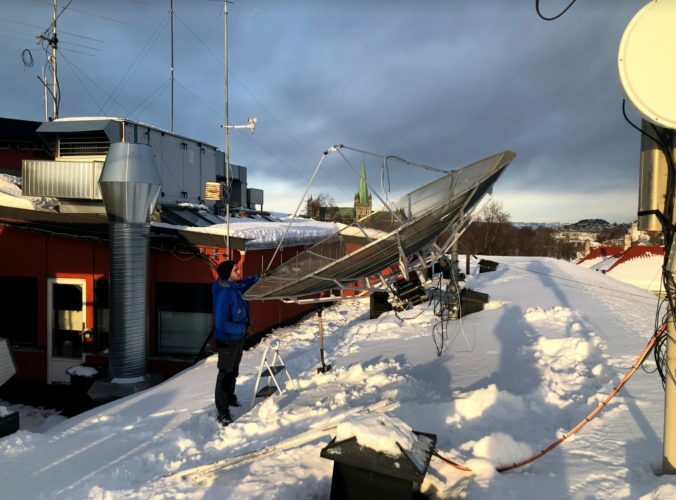 The Norwegian radio amateur in wintertime, shoveling snow. 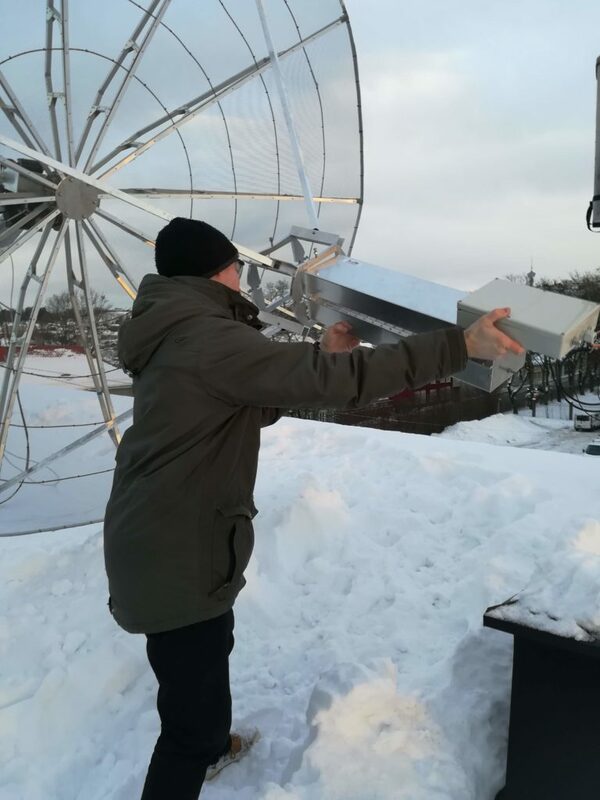 After we got the 23 cm RX-chain working the first time, we quickly noticed that there were a lot of limitations in working 23 cm EME using only linear polarization. 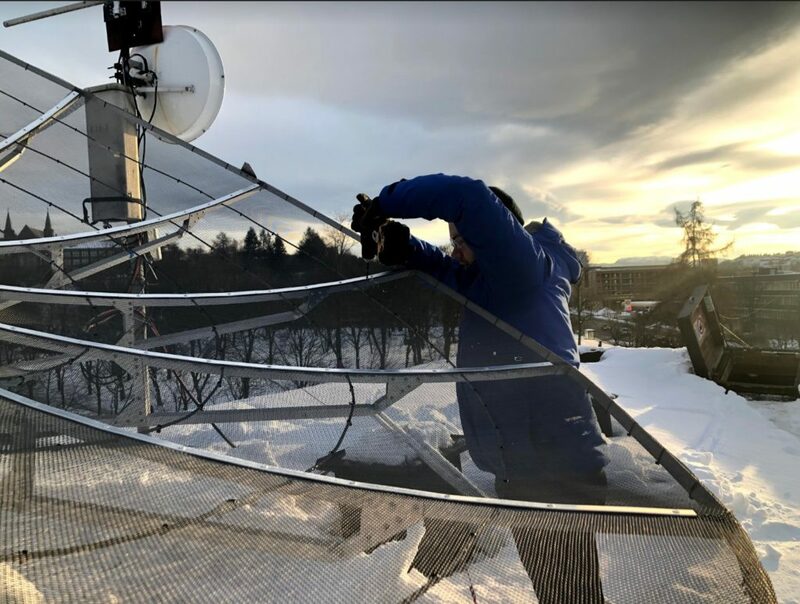 Notably, we actually only had one period where we were reliably able to listen to ON0EME, the rest of the time the propagation was either too poor, or the polarization was not resolving correctly. 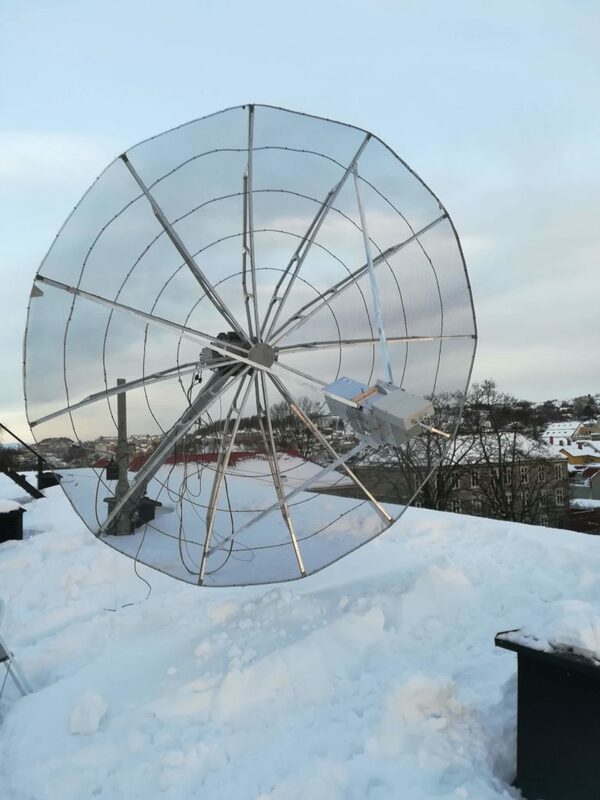 It turns out that using circular polarization is almost mandatory, as it is what all the other serious operators are doing – and that the 3 dB loss when receiving circular with linear is too large to handle. At this point we were feeling a bit down, and started researching alternatives to cover the five bands. This time with the added constraint to have TX on right hand circular polarization and RX on left hand circular polarization. 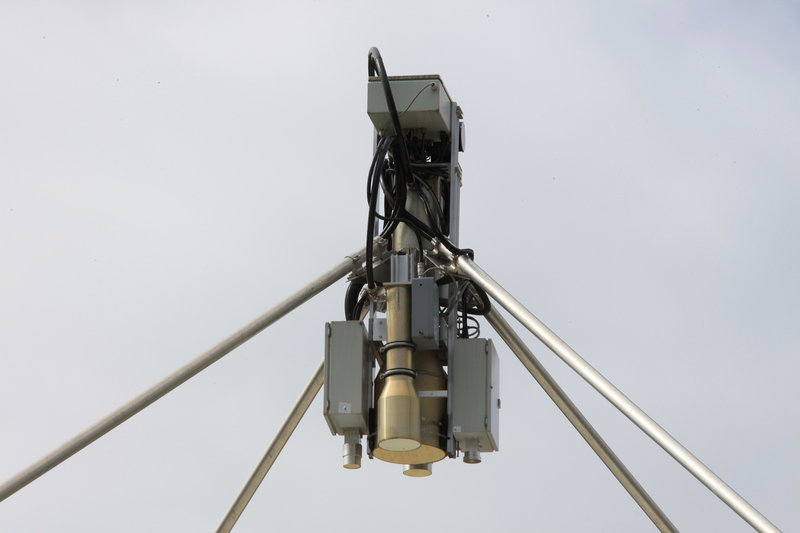 This method is desirable due to the polarization reversal that occurs when bouncing off the moon. We quickly came to realize that doing this would be an immense endeavor, as many of the required components are state of the art. This implies either spending a lot of time in R&D to provide open-source equivalents, or shelling out the money to buy the components. 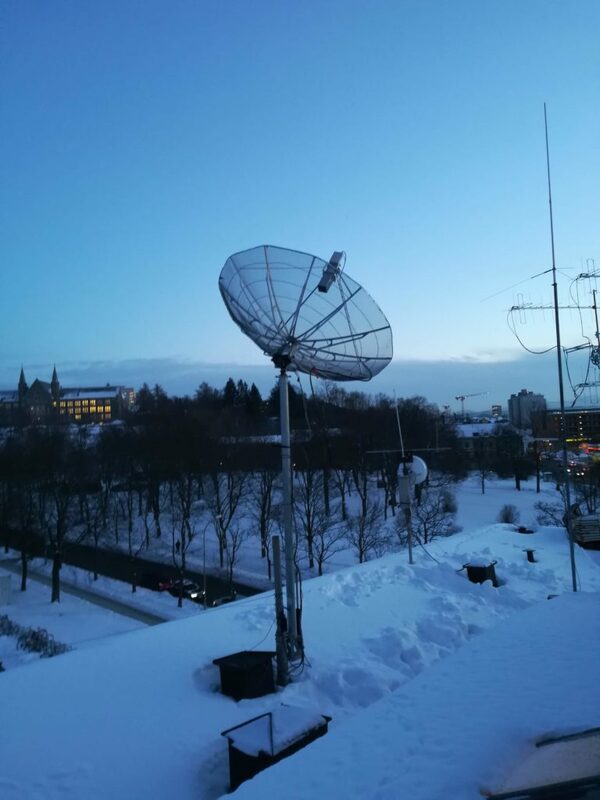 We reached out to other clubs that have successful multi-band EME setups, such as HB9Q. 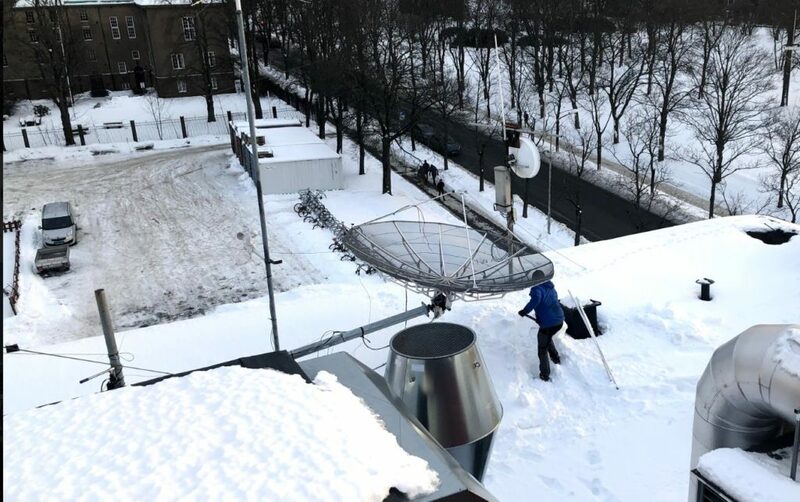 To our further dismay, we were strongly recommended to not pursue such a solution using only a 3 m dish. Partly because the main lobe squint would be difficult to deal with, but mostly because the added system loss, which according to their estimates are on the order of 3-6 dB, would be too large to handle. The straw that broke the camel’s back was that when winter set in late last year, the 5 band ring dish feed cracked open (again). At this point, this might seem like a sob-story, but this is not the case. These revelations spurred us to finally open a can of get-to-it, and set to work on a good, solid, single band solution. We ordered a RF Hamdesign 23 cm septum feed, and worked with the Kuhne parts that we had already acquired to create a full TX/RX chain. 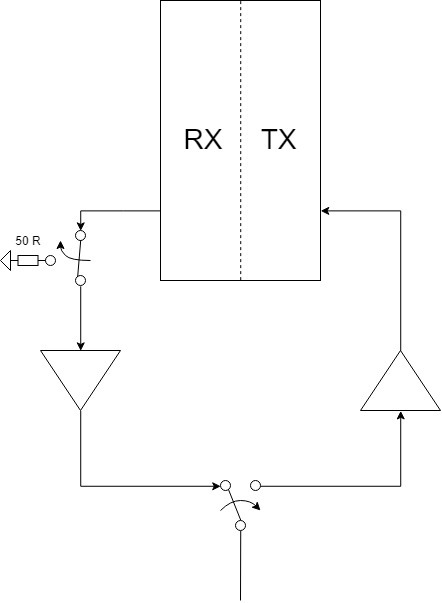 Top level sketch of TX/RX switching. 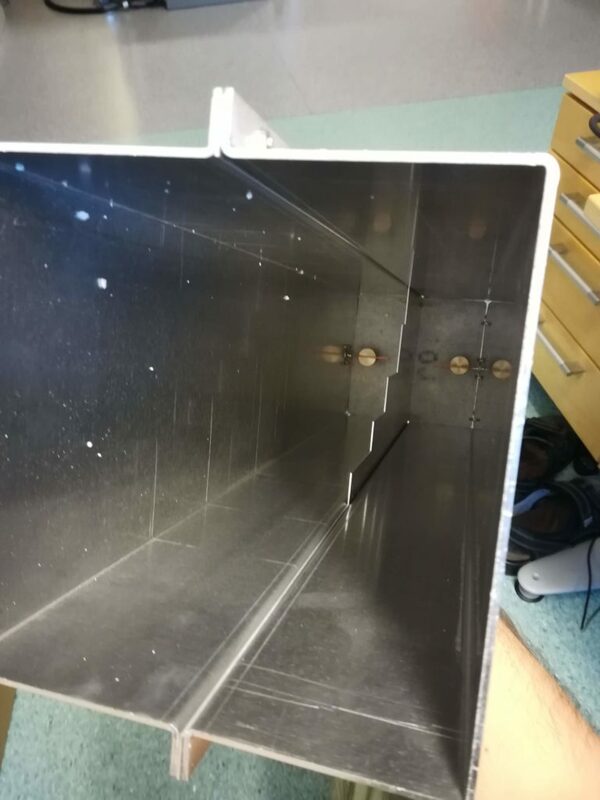 Inside view of the RFHamdesign septum feed. Septum feed about to be fitted with box for LNA/relay. Septum fitted with box for LNA, ready for mounting. In addition to the new feed, we also opted to change to a four-legged feed support. 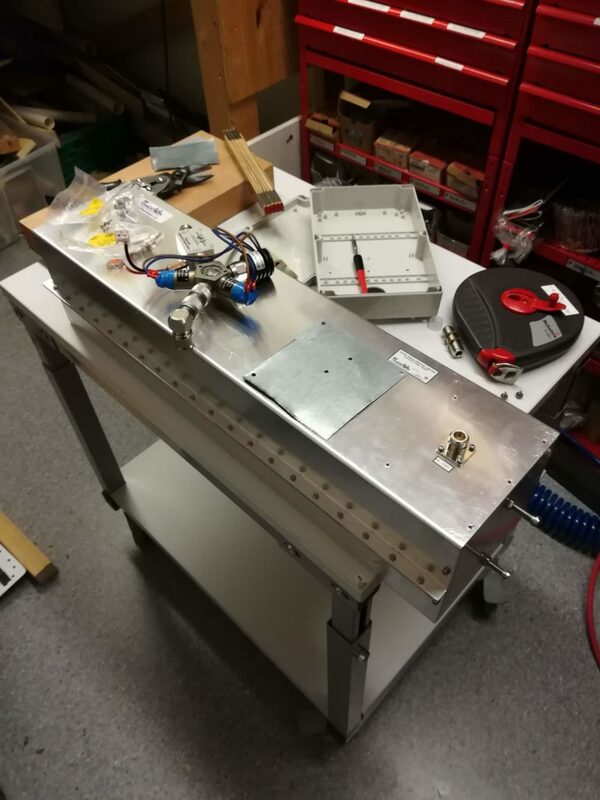 Partly because the three legged support has been a little shaky, but mostly because this meant that we would be able to order commercial off the shelf components. Drilling holes for the new feed support. With the new feed in place it was time to install the septum feed. 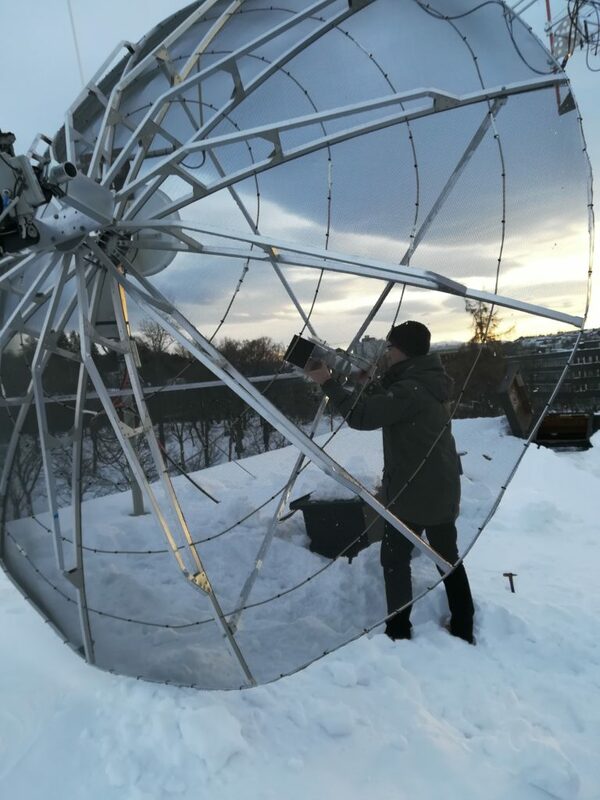 LA1WUA installing the septum feed. We were very lucky with the weather on this particular day, and it was truly a joy to install the system in such serene conditions. The more squeamish or OCDish of our readers might want to skip the next series of pictures. Prototypes will be prototypes, and this one is a particular sort of spaghetti. 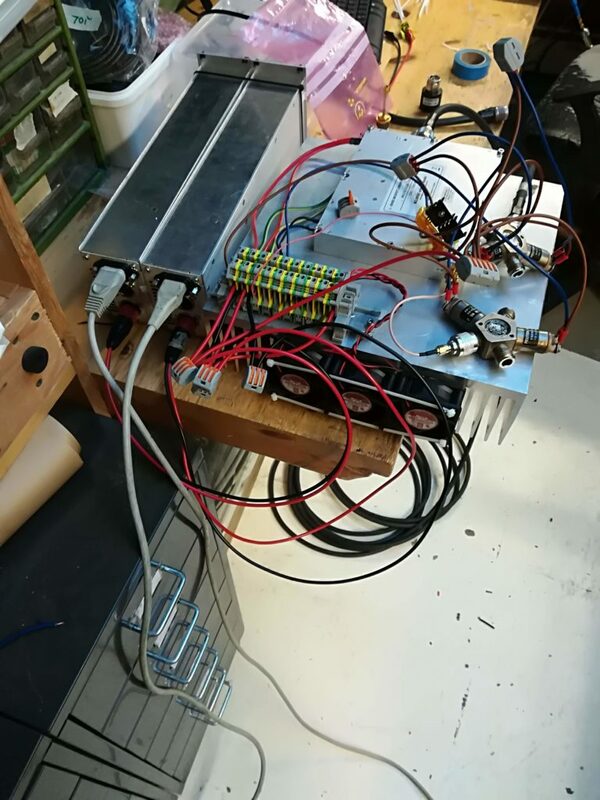 200 W 23 cm amplifier and power supplies on the lab bench. 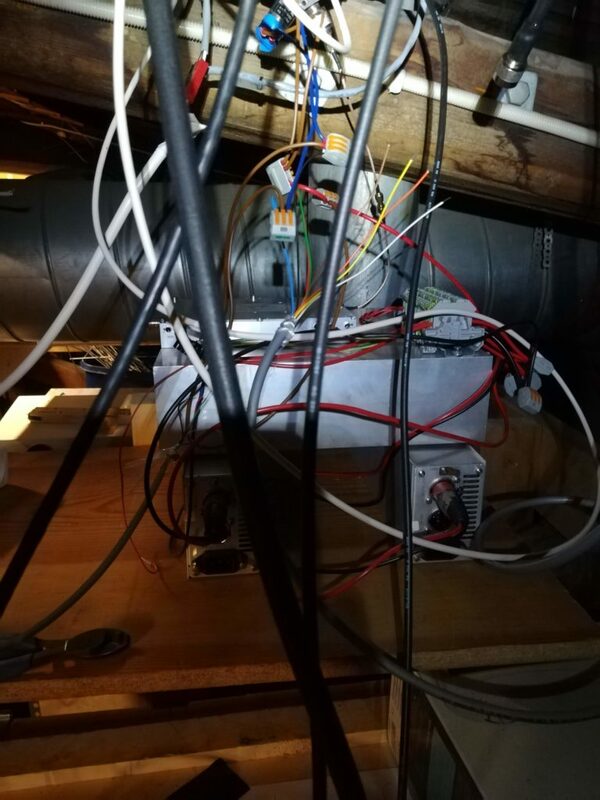 Full spaghetti prototype installed on the loft below the antenna mast. 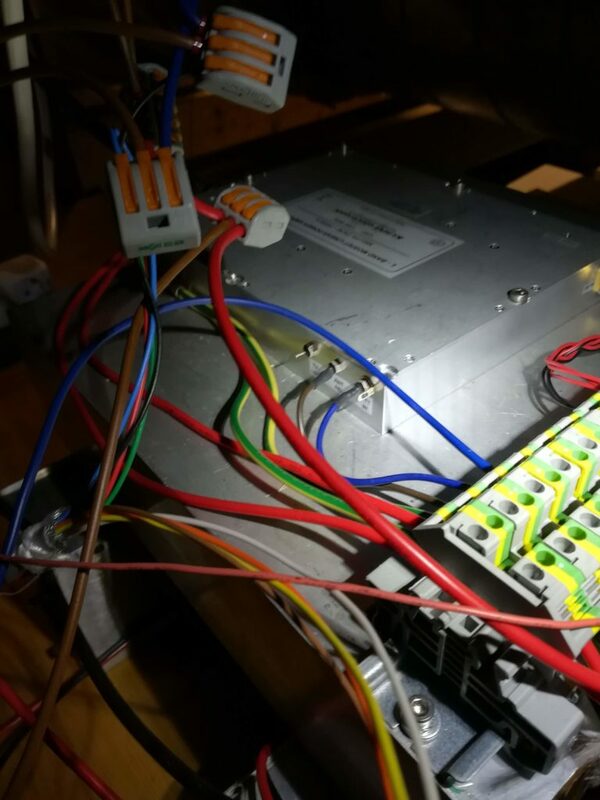 Later in the day, we also installed the coaxial cables, and connected the control wires for the LNA/relay box. And just like that, we suddenly have a fully working RX/TX chain for 23 cm. 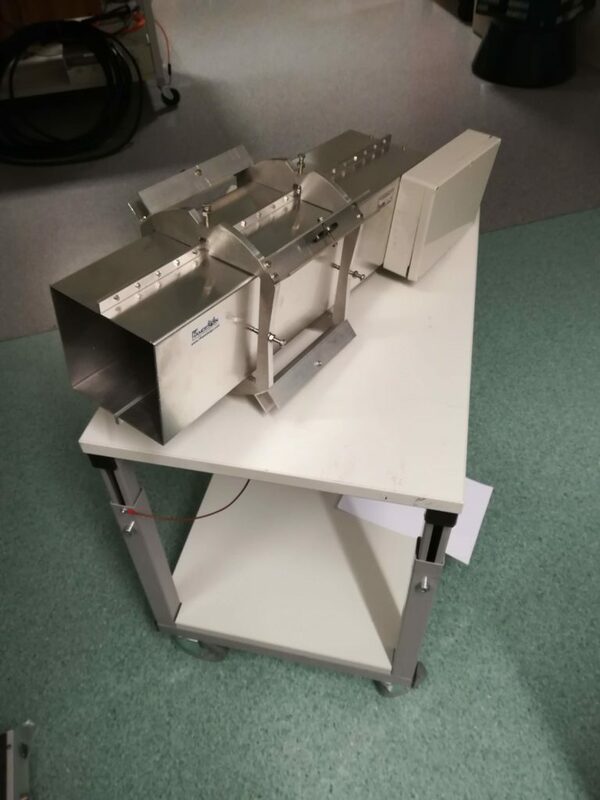 We did the regular tests, and were able to observe an increase in noise floor when the LNA turns on, and also that the PA gets warm when driven. We can not claim that we have been particularly efficient in our way towards getting on the band, but atleast we are finally on it. Now we just need to wait for new moon to clear, and then we will hopefully be able to work initials and hear our own echo in the coming week. Typical new moon conditions. Close trajectories for moon and sun cause a lot of noise, rendering contacts via the moon impossible. Good News…..glad you got the RF ham septum at last (same as mine). One imporen note. there is fault in drawing from RF ham about the switching block diagram. The LNA’ input should get the 50 Ohm load on transmit, not the RX port! This is a fault we see often. The main goal is to protect the LNA not to enshure a 50 Ohm load on the septum RX port during transmit. See you soon on the moon. Ah, that is good to know. For us it seems to not matter all that much, as the LNA we use doesn’t mind an open input, and the relay we use will give the same isolation in either configuration. Are there any other drawbacks to terminating the RX port in 50 Ohm? There is a small advantage terminating the RX port, but then one would need two relays…not worth the extra coast. Connecting the the LNA to 50 Ohm is a must in my mind. I have blown two times my LNA by connecting the relay wrong way as shown! But if money and time is not a problem, og ahead and try. Anyway how a bout a EME sked? ON0EME is -17dB today and my own echoes -19.6dB. What to try? Absolutely, I’ll send you an email regarding the sked.